After comparing existing derive apps, I decided to throw together my own creation. Upping this, I’m now working together with Eduaordo Cachucho, creator of the web-based deriveapp, and together we created deriveapp 2.0.
deriveapp 2.0 is a web-based mobile app that facilitates a randomized meander through an urban environment by prompting the user with tasks that nudge him to experience his direct surroundings in an unconventional way, heightening the experience of the city for the user, while essentially playing a game. Because this experience of the urban environment does not rely on the actual physical location, but still results in a meaningful and unique experience, it’s the exact obverse of conventional tourism. The objective for building deriveapp 2.0 is to create a simple but engaging platform that allows users to explore their urban spaces in a care-free and casual way. To take the ideals of the Situationists and the concept of psychogeography and merge it with digital means in order to create a tool that implies an exploration of urban space in a random unplanned manner, as a game. Deriveapp 2.0 is being created to try to nudge those people who are in this repetitive cycle, within their urban environment, to allow the suggestions and subjectivities of others to enter into their urban existences. This ideally builds a new understanding of their urban surroundings, opening up new channels of dialogue between individuals through a device that makes the unpacking of urban space part of a game. Task cards that are dealt are created with the intention of heightening the experience of the city for the user, by calling them out to search for specific architectural, urban or social points of interest. Additionally, allowing each user to add their own tasks and therefore their own subjective reality, allows users of the application to see their urban spaces in a different light. The result of using deriveapp 2.0 is an assisted random walk through an urban environment, a dérive. My app and the derivator website merged into the new derive website. + Individual derives are registered and stored for later perusal. + Individual GeoRSS feeds are created for each derive, meaning that the results can easily be exported. + A clever algorithm decreases the likelihood of the same card being drawn in close succession. + Individual relative likelihoods can be set per card. + The user can choose from a range of decks and mix multiple decks together. + A clever algorithm chooses unique background colors for cards that don’t have an image associated with them. + When cards are not stored with the location they were drawn at, interpolation later approximates their location. 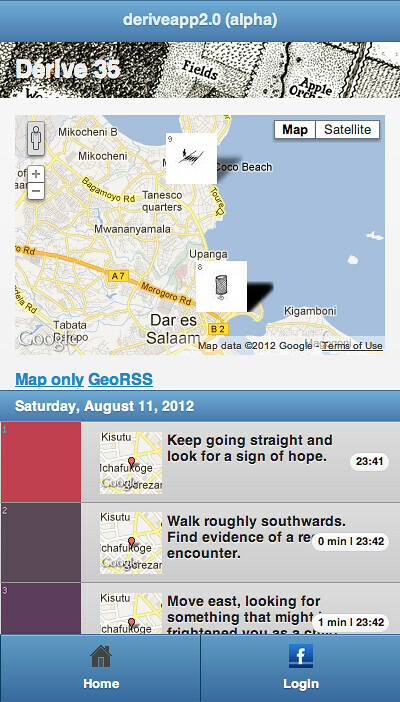 + Photos uploaded to Flickr and matching an individual derive are shown on a map, with the cards drawn for that derive. + Consolidate the deriveapp website with the alpha version of deriveapp 2.0 into one web-based location. + Move existing (non-app) content into a CMS. + Expand personalized functionalities of the app through Facebook authentication. 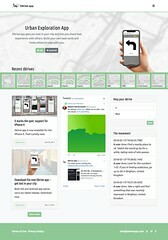 + Create a design for deriveapp 2.0 that’s more in line with the original deriveapp. + Allow for users to submit their own decks and cards. In early 2013, deriveapp 2.0 won the World Summit Award 2012 in the m-Tourism & Culture, representing Uganda. 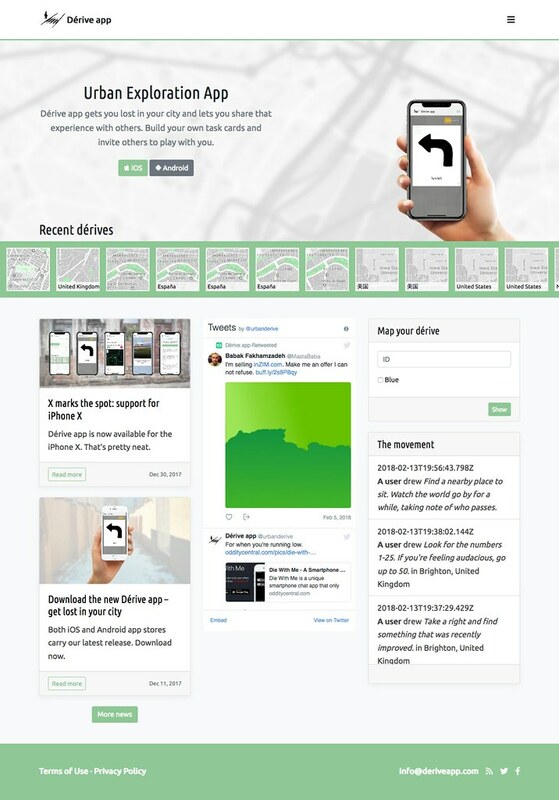 On January 19, 2013, Dérive app hosted the first Dérive Day. In January 2017, Dérive app became available as a downloadable mobile app for both Android and iOS. In August 2017, just in time for Dérive Day 2017, we added ‘hosted dérives’, where all participants, wherever they are in the world, get presented with the same task cards, at the same time.